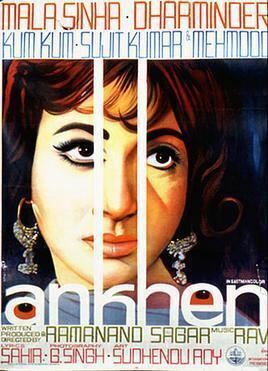 Ankhen (The Eyes) is a 1968 Hindi spy thriller produced and directed by Ramanand Sagar. After the surprise big hit of Farz as a spy thriller, Sagar came out with a bigger budget film in the same genre, shot in many international locations. 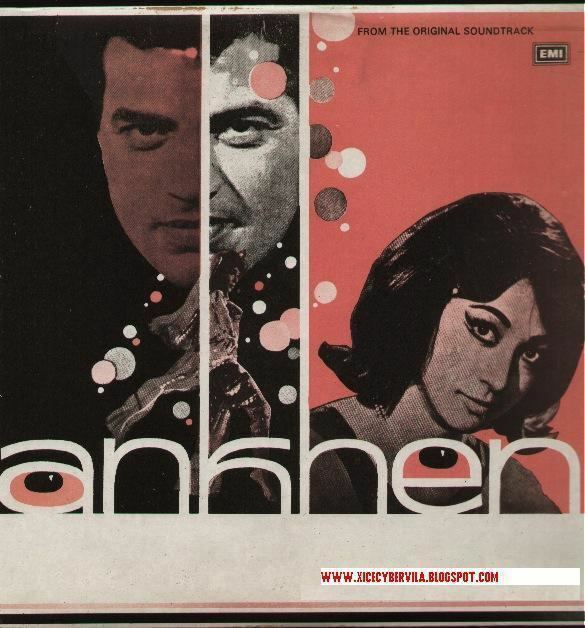 The film stars Mala Sinha, Dharmendra, Mehmood, Lalita Pawar, Jeevan and Madan Puri. The music is by Ravi and the lyrics by Sahir Ludhianvi. It was estimated to be the most profitable Indian film of 1968 in India. 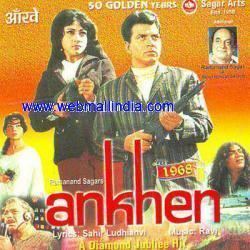 Ankhen is considered to be a pioneer in Hindi spy films. It was initially planned to be shot when Dharmendra had just one film. But the director Ramanand Sagar had apprehensions of casting him since he was considered raw and was not yet a star; therefore he recruited a huge star of the period, Mala Sinha, opposite him for marketing considerations. With the success of Phool Aur Paththar, Sagar decided to increase his budget and finalize Dharmendra as the leading man. Shortly after independence India faces terrorists attacks in Assam, resulting in many deaths and casualties. A group of concerned citizens, who are not connected with the government, decide to do something to stop this carnage. While Salim is already at work in Beirut, his cover is blown and he is shot dead. Now Sunil Mehra must travel to Beirut and take over. Once there, he meets a former flame, Meenakshi Mehta, and a female admirer by the name of Zenab. The terrorists are headed by a man named Syed, who deputes one of his assistants, Madame, to spy on Sunil's dad, Diwan Chand Mehra, by posing as Mehra's daughter's aunt, forcing her to obey by abducting her son, Babloo, and holding him captive. Soon Syed and his associates, including Doctor X and Captain find out all secrets of Mehra, as a result of which Sunil is trapped and held by Syed. Then Diwan's world is shattered when Meenakshi telephonically informs him that Sunil has been killed. The question remains what will happen to Babloo, Diwan, and the rest of the concerned citizens, especially when they have become vulnerable due to Madame's presence in their very household.